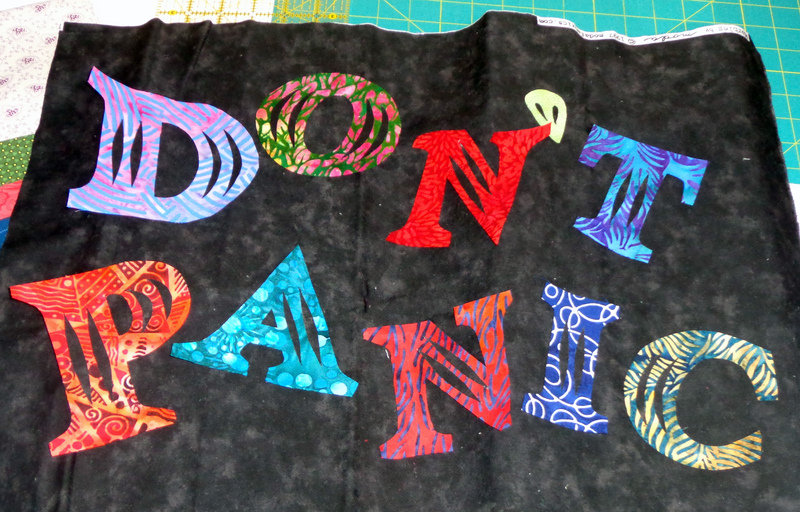 A few of us are sewing for Memorial Day Sew In #MDSI and so I’m finally working on the background to my “Don’t Panic” quilt. 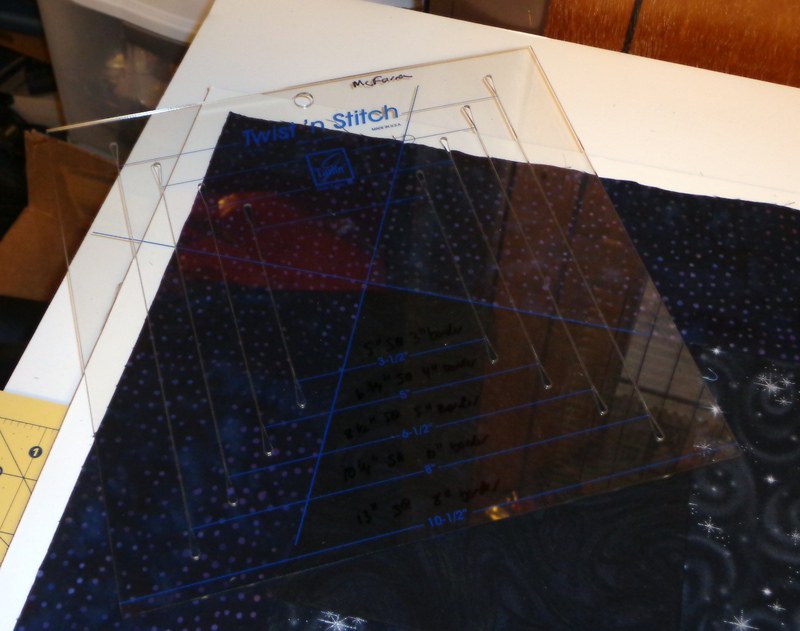 I bought a June Taylor Twist and Stitch ruler on friday, something that I was looking for at MQS. But I am glad I waited because now my LQS has some more of my business. Anyway, I have been obsessing with darks, dark blues and dark blacks. 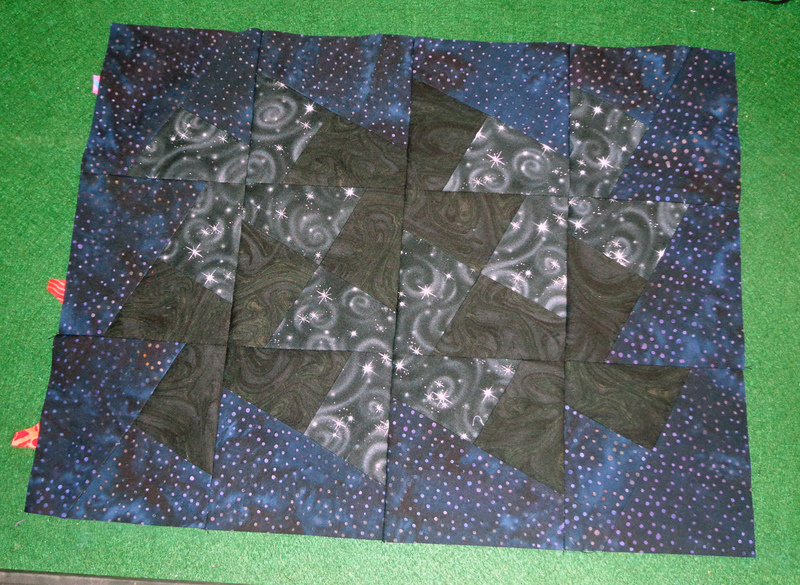 I needed them to set off a Dancing Ribbons Quilt (more to come on that in the future), I bought some more darks with a space theme in mind for my Don’t Panic Quilt. 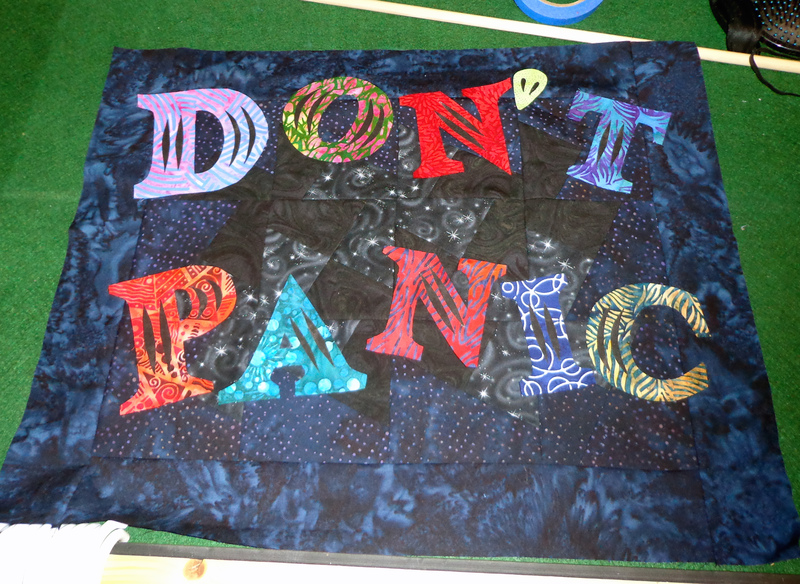 Don’t Panic, for the uninitiated, is a saying that is found on the front cover of the Hitchhiker’s Guide to the Galaxy, otherwise known in geek circles as H2G2. This is a book within a book of the same name, Hitchhiker’s Guide to the Galaxy, written by Douglas Adams. It may or may not have been a radio drama, a series of books, a television program on the BBC, and a blockbuster hollywood movie, a compilation, or an audiobook, text based video game which I may or may not have played before. In the 90’s I bought the compilation book that had several stories of the characters Arthur Dent, Ford Prefect, Zaphod Beeblebrox, and Tricia MacMillian – don’t forget Marvin the highly intelligent manically depressed robot. Any event, this book / story is about Hitchhiking around the Galaxy and all the adventures of these characters, set with a tone of very highly unusual (read cultish?) British humor (humour?) poking fun at everything, and ultimately finding out (or not) the answer to “life, the universe, and everything”. For those of you who have not heard of this story, please go back to thinking about how your digital watches are a very good idea. Meet you later. Oh and can I borrow your towel for a while? Since I tend to panic, and last year printed out a list of perfectionistic suggestions that has been taped to the wall directly above my desk, most of which these suggestions could be summed up in two words: “Don’t Panic”. Which is what I want to do – remind myself not to panic. With a Quilt, none-the-less. And I’ve always liked the phrase Don’t Panic, even when I completely don’t comprehend what hat means most of the time. So I started with words on freezer paper. Which then got transferred to crazy batik fabric. I kept thinking black background, but that’s not goofy enough, not spacy enough for this book / idea / fanart kind of thing. But as you can see with the font I chose, it was supposed to be a reverse applique kind of thing wherein the background should be showing through the letters. 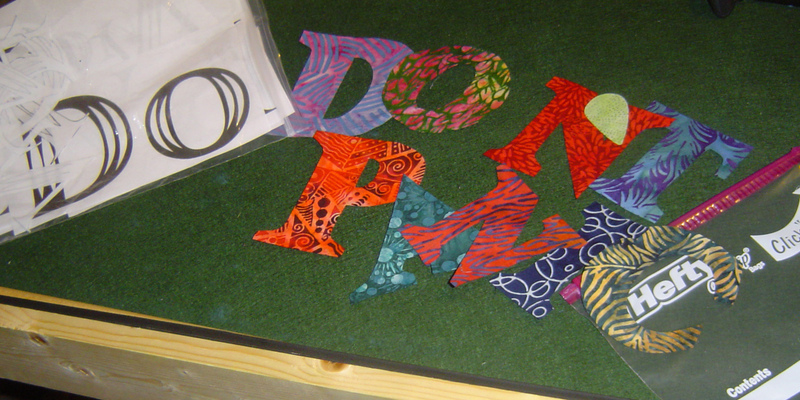 I made these letters on freezer paper, intending to turn under the quarter inch and glue them down before appliqueing (and reverse appliqueing) them down to the background. But I liked them. And I got lazy, so I am deciding to raw edge appliqueing them down. But I wanted the little bars to show through, so I made them and raw edged the bars down to the fabric as well. And this way the width is nice too. 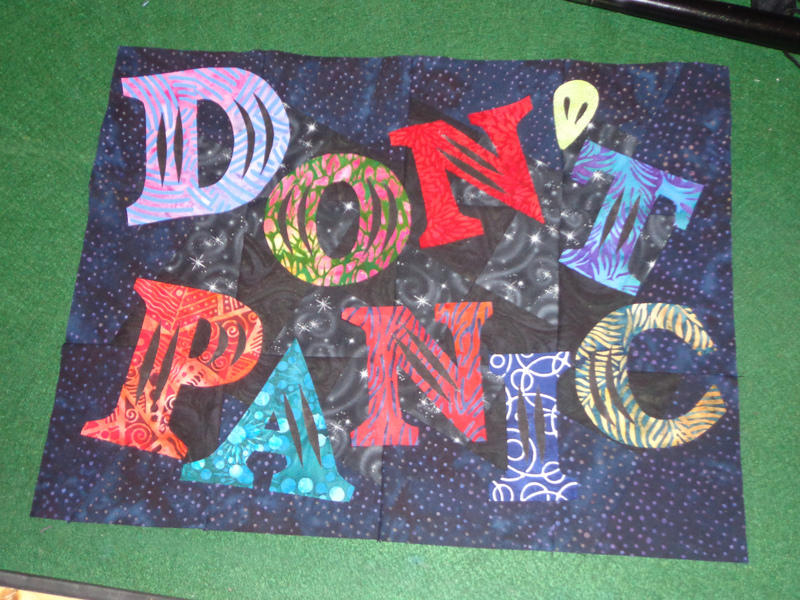 So I decided a few weeks ago I would make a twister background, and put that behind the letters, even if none of the twister background shows up, I still know it’s there, and there’s some interest in the back of the quilt, which I want to be dark. 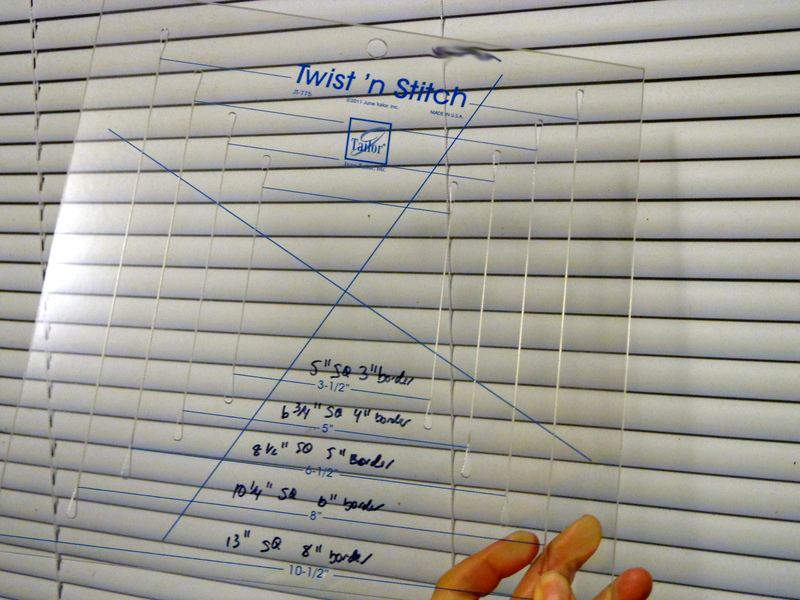 I didn’t find the ruler at MQS, but after searching online last weekend, not finding it at Joanns or Hancock (big box fabric stores), I wanted to order the Twist and Stitch ruler from June Taylor on Amazon. I have the Shape Cut ruler that works on the same principle, predetermined lines at premarked sections to aid in cutting quickly and accurately. As you may notice, there are some numbers that I wrote on the ruler. 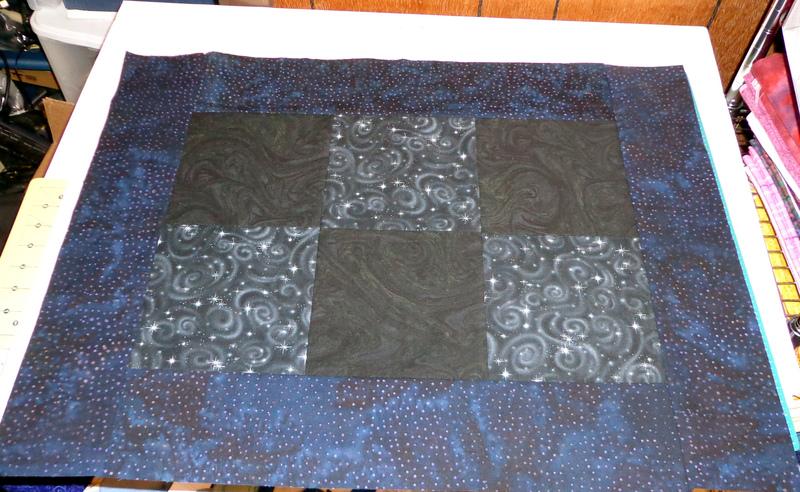 To make 3 and a half inch blocks, you need to start out with a mini quilt (made of just squares) that each square is 5 inches, and the borders on the outside need to be 3 inches. I found it not as useful for this information to be on the paper, but why not on the ruler itself? So I put it there. Smart idea. Then when the paper gets lost (no – never happens to me! – shock – horror), the info is still right there. Why can’t they print it on the rulers guys? Anyway, not a ton of action shots, but here is the mini quilt that has to be made in order to cut it up to use the twist ruler. My version started with 6 & 3/4 inches that eventually cut down to 5. That white and black fabric is way darker in real life, this shows more contrast than there actually is. I ALMOST (and should have) went with 3 squares by 4 squares in the middle. But I had calculated and this was going to produce me with the size I needed. So I took a picture of cutting the first block. Hard to see, yes it is. The blue lines in the ruler match up with the perpendicular lines in the quilt itself, my borders and my blocks. From here I moved to the kitchen table, and as such forgot pictures of the process. I remember very distinctly Jackie from CV Quiltworks had a twister tutorial, if you want more info on how to make the twister blocks, check out her site. But you line up the blue lines along every intersection of two fabrics at a point. And then you remove the blocks that you cut. And then you sew the new blocks together. Cute. But a little TOO SMALL for comfort for my letters. Yes it really does fit, but what about quilting shrinkage? And my commentary about the usefulness about buttons not being toys? And the vogonity of it all? It needed a border. Again. Now I can breathe a little bit more, and panic a little bit less about the edges. Oh yeah, “the answer to life, the universe, and everything”. Don’t want to forget that?! But it’s not an answer I really want to hear. Or see well, so I’ll hide it into the background a little bit. Sadly to get to this point there was a huge freakout. My pellon was sticking to the backing paper, and then when trying to peel it off, was not sticking to the fabric, only to the backing paper. Which meant I had to a) not panic and b) get out the roxanne glue with the teeny tiny barrel and c) wash out the teeny tiny glue barrel …. And now I have realized that I will have to get out the glue thing again to put the letters on. But I’ve done lots and lots of progress on this quilt, and so will be putting it aside for an undetermined period of time (maybe tomorrow), and I will go outside finish some lawn stuff and then come here and play a diablo-like video game for a few hours. Wow! You achieved a ton of progress with this in such a short amount of time. My oldest son would TOTALLY love your thought process and your symbolism on this quilt. It’s perfect. Ironically, I was playing around on Jackie’s website recently and took a look at her tutorials. I had seen the twister templates and, from the packaging, could never get an idea of how this would work. Her tutorial was perfect. I was thinking the low contrast fabrics you chose might not work with this technique but I think it works brilliantly. Definitely a success. And since I know you enjoy piecing backs, I am looking forward to what you decide to do back there. Your achievements this weekend are so much more evident than mine. I did a ton of sewing already but it’s all been hand sewing and might not look like much of anything to the eye of a casual observer. Fun none the less. It’s really interesting to see your process. Lately, I’ve been reminding myself “Don’t Panic” a lot, coupled with lots of deep breathing,so I love this. Happy Towel Day! I love the background fabrics, they’re perfect for the hitchhiking. 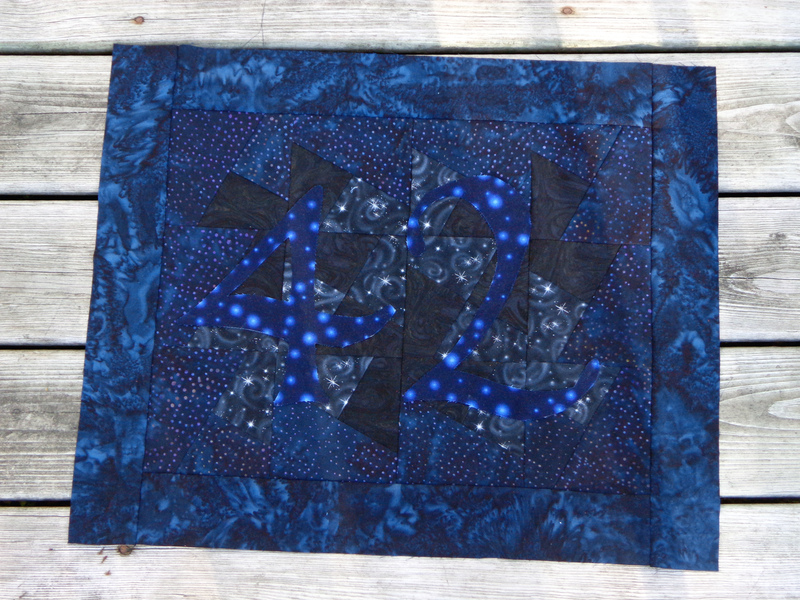 So is the commentary about buttons, vogonity, and answers going to be quilted words in the background or border? Inquiring geeks want to know! Well I don’t know about vogonity, but I was considering embroider or quilting “buttons aren’t toys” and then sticking a large button onto the front somewhere. I also don’t really yet have a plan for the back. I may have to listen to the books again. The answer is already there in the form of the 42 that you really can’t see all that well because of the busy background.